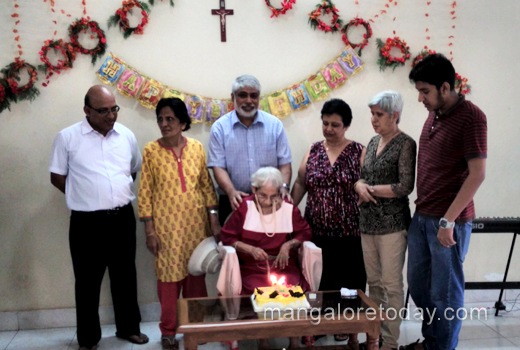 Mangaluru, March 30, 2017: Gladys D’Souza’s glorious achievement to mark the beginning of her 100th year of a life time that is amazing, incredible. Today, March 30, 2017, she arrived at the 100th milestone, a rare feat, her lively joy and total participation gives meaning and an example for aging with dignity a thing of beauty. 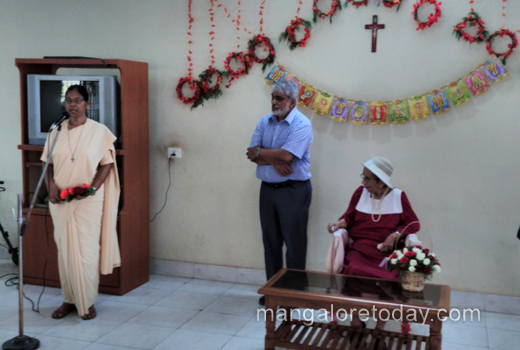 At Nympha Sadan, Mangaluru, it was for the first time a resident touched this lofty mark in it’s 10 years of existence. The honours were given a filip by Gladys son Trevor who is present here from Toronto Canada. The near and dear all present concluded that it is only the positiveness of her frame of mind consistently that is the driving force for her achievements. The day as in most such institutions started with prayer and a special thanks to the Almighty. 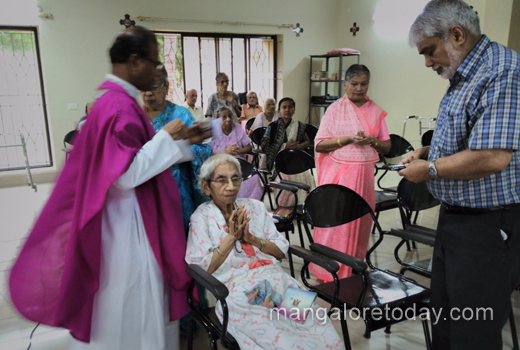 A special thanks giving mass was offered in the Chapel led by Fr.Francis D’Souza from St.Anthony Ashram with the care-giving nuns and residents participating. Glady’s bai read in a firm and articulated voice a special prayer of ’Thanks giving’ to the Lord which was very touching indeed. The goodness extended to her by the sisters over the years and caregivers was appreciated. She then joined the residents in the Dinning room, without any help at all, which has been her habit for the last many yeras with the help of her special walker. Just before lunch for which many of her near and dear were present along with the sisters, residents and care-givers a brief and enjoyable Centenary jubilee programme was held in the well decorated Hall of the home. Fr. Ivan Mendonca SJ and his musical youth group conducted a short prayer and song. The cake was cut amid cheer and clapping. There was quite a lot of bonhomie and exchanges before son Trevor made his centenary speech which captivated those present. In his speech Trevor mentioned " Even though I was born and grew up outside Mangalore, I am proud to be a Mangalorean and feel blessed to have my mother here in Nympha Sadan, where she receives such excellent care, very grateful to all the nuns too. 99 years and no sign of fading away. My Mum has 11 grandchildren and 11 great grand children and has visited Canada and the US to meet them on many visits. My mother, a very strong woman brought up 5 children on her own - Gloria who with her daughter Liza will be coming down from Canada next week, Pamela, who God bless her soul, passed away in Dec 2013, Norma who is now retired in Toronto and Christopher who is recovering from his surgery in the US. All of them send their love and best wishes and are with us in spirit, on this auspicious day". Trevor went on to thank all very much for concern and assistance on all fronts. The administrator of Nympha Sadan, Rev.Sr. Benny Fernandes speaking on behalf of the institution in a few words highlighted the sterling qualities of Gladys Bai over the years and specially appreciated consideration and gratitude shown for the service rendered to Gladys here by one and all. She prayed that God bless her, her folks and everyone else too. Gladys D’Souza nee’ Currie, cheerful, smiling, holding on to her wheeled walker for support, appearing in the different parts of the Seniors Home, well turned out, neat, clean, full of smiles for those around, she lives an active life, enjoying her good fortune and complaining little. Her prowess in Caroms and Sudoku for many years have kept her going strong say many who know her. 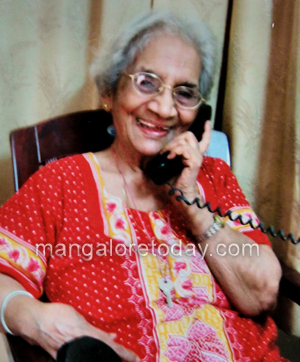 Gladys D’Souza, (nee’ Currie), hailing from a prominent Konkani Catholic family of Mangaluru city proper; her ascendants were well known ancient residents of ’Candle garden’ between the present Jyothi Cinema and Woodlands Hotel, at the foot hill of the legendary St.Aloysius College. Records indicate that several members of this family, originally called "Correa" worked in Burma in the early 1900s, some took the name of "Currie" caused by language and social nuances, both names are alive among this family spread wide; many returned during WW1 and settled in Calcutta, Bombay and Mangalore. According to Trevor D’Souza, 67 yrs, son of Gladys, who has come all the way from Toronto Canada to represent his family and siblings. Many of the extended family have joined in here to make Gladys’ day a very special one. Gladys was born March 30, 1918, in Rangoon (now Yangon) Burma, now Mynmar; the eldest of 5 brothers (Archie, Oswald/Ozzie, Ralph, Basil, Darwin/Banoo). Her father Casmir Nicholas Currie (Correa) and mother Annie Alice nee’ Menezes. She was educated at the Good Sheppard Convent school in then Rangoon and to this day reads everything possible and her command of English impeccable. Her husband, Joachim Lawrence D’Souza,(1905-56) a marine Engineer in Rangoon port, whom she married on December 29, 1942, doted on her just as her parents had always done. They had to move out of Burma for good to then Calcutta in the mid 1950s, after her husbands death she tried to occupy her self in teaching at Don Bosco School, Park Circus, Calcutta, but then decided that her priority was to look after the children and the home, which in those times was very hard full time work. She managed to bring up the children to do well in their education and life. The 5 Children are Gloria, Pam, Norma, Trevor and Christopher. 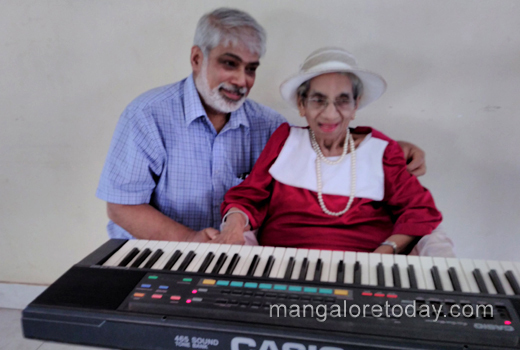 Centenarian, Gladys, has been living in Mangaluru since 2008, She has always told her near and dear who visit her frequently that she likes being in the secure care of Nympha Sadan, as it was too risky for her to live in Mumbai and she did not like the weather in Canada/US. The food and serene life here in Mangaluru is just right for her. She loves to smile and interact with groups who visit and give performances of music in particular at the old age facility she lives. Her best and fun side surfaces when she is at her electronic key board and she regales the audience with her rendering of old western songs and hymns. Her love for music and life clearly shows up in the way even to this day with the support of her wheeled buggy, a type of walker. ago. 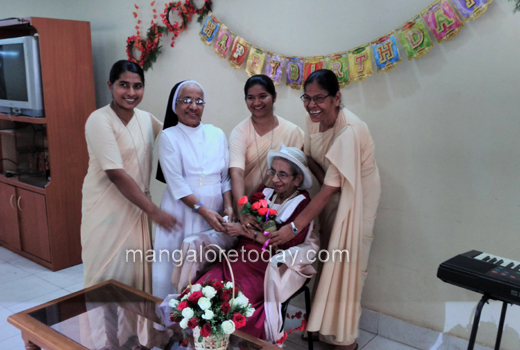 The Mangalore Ursuline Franciscan nuns who run the home said, she never misses her food in the dinning room at her fixed place. Eats well for her age and declines any help to eat, the local ’Sannas’ (Idly) being a favourite. She sternly ignores any suggestions that some of her meals be taken in her self contained room. 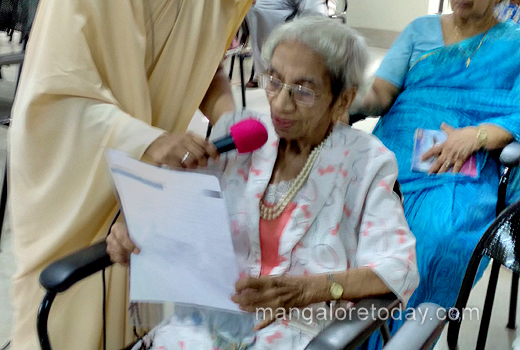 She was surprisingly fortunate to have three of her cousins here in this institution; particularly Ivy Currie who was also in Rangoon with her parents and came back to Mangalore in mid 1940s, Ivy passed away at 98 last year. Marie Correa now in her mid 80s too lives here now, her brother Gerald, who lived here too passed away a couple of years ago. Gladys loves receiving phone calls from her children and grand children who are all overseas. Though her hearing is poor, surprisingly she hears and responds better on the phone. Her flair and love for music is ever present as her trade mark smile. Baffling episode: She is a victorious cancer survivor. As recently as 2015, she was diagnosed with cancer of the breast and treated at Muller’s hospital with the support of city’s leading Oncologists. Her son Trevor was down here then too from Canada and the nuns in-charge spearheaded and coordinated the needed care. Though at one stage it seemed a lost battle, the fighter of big battles that Grand Mother and Great Grand Mother Gladys is to many is now in fair health given her age of a full century on earth. Leaving the hospital when she was told that she is fine and will live to 101, she frowned and said ’I will live to at least a 110’, her determination and courage will definitely prevail over all else is are the prayer in unison.